A recent email brought the sad news of the passing of Dutch railway photographer Hans Steeneken. The email was from someone who has now got access to his emails, and he said that he died ‘last June 6th’, but I’ve just checked my emails and my last email from Hans was September 2011, so I presume he means June 6th 2012. I’d corresponded with Hans for a couple of years since he got in touch with me after I blogged on his book ‘All trains To Stop’, and although I didn’t know him that well, we discussed photography, cameras, and shared book recommendations on railway photographers and industrial decay. Hans was looking for a publisher for a book he’d put together of his photographs of the steam railways of India, I don’t know if he had been successful in doing so at this point, and whether his estate will be able to follow this through. 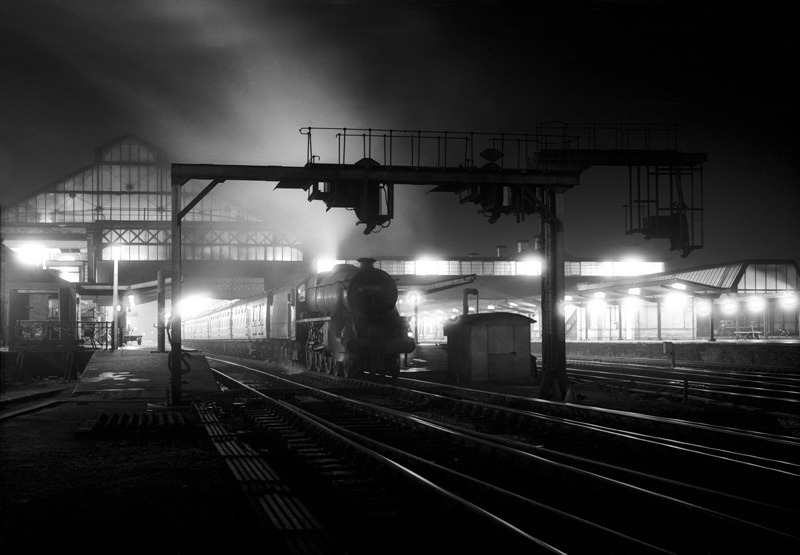 I don’t know any more details at this point, but I’ll leave you with this photo taken at Preston Station that Hans sent me in one of his last emails, taken in 1966. A great shame, he was a brilliant photographer. I remember gazing at the photos in that book ‘All trains To Stop’ in amazement, they were a new and exciting approach at the time. I’m sorry to hear this sad news. This is such a beautiful photograph. Thank you for sharing it with us. Check out my version of Hans Steeneken’s Preston shot if you care to. Sorry about the ‘dirty’ scan. Thanks Tony, nice to see a different perspective on the scene http://www.flickr.com/photos/74596785@N06/7955479322/in/photostream. I was actually at Preston station today, returning from London. I wasn’t around in the sixties, but I don’t think the station has changed that much, it’s still a pretty grand place. I always thought it a particularly large and impressive place for a medium size town (now a city, somehow) that was of no particular consequence in the grand scheme of things. Yes, Preston had so many photographic opportunities even at such a late stage for steam as 1966. I think it was important Andy. Remember it was on the main line from England to Scotland, connected to Manchester and the Midlands and, perhaps most important of all, long before package holidays, Blackpool! We stayed there for a hour or so ( God it was chilly and no station cafe open either!! ) then headed for Springs Branch shed, warmth and a cup of cocoa with the fitters. Happy days. Thanks for the comment and thanks for the link, glad you like the post. If you go on Flickr and look for ‘anthonyB17’ you will see the photographs of an English friend of Hans, many of which were taken with Hans when Anthony was visiting Germany and other places in Europe. Thanks, Andy! I like those (two?) Flickr pictures of these old steam engine landscapes!